1 Ecotec University, Ecuador. calcivar@ecotec.edu.ec. 2 University of Milagro (UNEMI), Ecuador. jcalderonc@unemi.edu.ec. 3 Ecotec University, Ecuador. vraffo@ecotec.edu.ec. 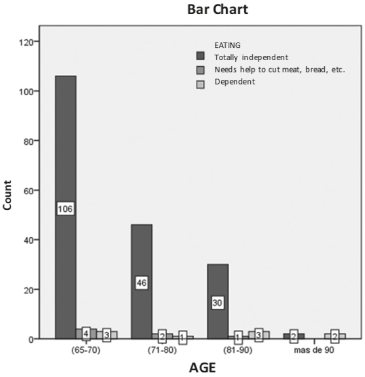 Key words: elderly persons; family; aging; contingency tables; correlation; gerontology; social integration (Source: DeCS). Palabras-clave: adultos mayores; familia; envejecimiento; tablas de contingencia; correlación; gerontología; integración social (Fuente: DeCS). Contexto: O presente artigo visa analisar em que medida as necessidades físicas e recreacionais dos idosos das comunidades de Posorja e Puna, no Equador, estão sendo atendidas. Atualmente, sabe-se que a atividade física é benéfica para os idosos, já que ajuda a diminuir enfermidades e todos os tipos de doenças. Metodologia: Neste estudo, a população é composta por 378 pessoas idosas com idades entre 65 e 90 anos - 200 pertencem à comunidade de Posorja e 178 à comunidade de Puna, na província de Gayas. As ferramentas utilizadas nesta pesquisa incluem, entre outras, o Teste ADL (Activities of Daily Living), que avalia o grau de autocuidado e mobilidade; a Escala de Lawton e Brody, que é um instrumento apropriado para avaliar o nível de independência e as habilidades; e o MEEM (Miniexame do Estado Mental), que avalia funções cognitivas, como a memória, a linguagem, a práxis e a atenção. Todas elas são essenciais para detectar e diagnosticar a Doença de Alzheimer. Resultados: Várias técnicas estatísticas foram usadas para obter os resultados, tais como análise descritiva, tabelas de contingência e principais componentes. Conclusões: A população entre 65 e 90 anos foi analisada e somava 35,9% da população total em 2010, o que significa que houve uma variação. Atualmente, essa população representa 56,6% da amostra obtida. Esse grupo geracional se refere aos idosos, que deveriam ser favorecidos por políticas públicas que visam melhorar programas de saúde, gerar espaços recreacionais e abrir centros especializados no cuidado de idosos. Em geral, as dinâmicas demográficas de Posorja mostram uma pirâmide estruturada com uma população em expansão, uma grande quantidade de jovens e adultos que contribuem para as dinâmicas econômicas e para a produtividade da região. O questionário poderia ser adaptado para conter as especificações requeridas para adequar-se às verdadeiras dimensões dessa população. Palavras-Chave: correlação; envelhecimento; família; gerontologia; idosos; integração social; tabela de contingência (Fonte: DeCS). The universal protection model for all citizens, financed with taxes.This is the model adopted by Nordic countries and the Netherlands. In it, social services are a logical extension of the notion that the State is obliged to satisfy the basic needs of its citizens, in the same way that it satisfies any other health or educational requirement. The assistance model directed towards citizens with no resources,which is the one most applied in Southern Europe. It is a public system, financed with taxes, and has limited coverage. It is destined to satisfy the basic needs of citizens who are living in a co-dependent situation, with a lack of resources and, thus, limited coverage. Document analysis was used to gather information. A detailed review of the medical records of elderly persons was done to get to know their age-related diseases and the kind of activities they can perform. It was also used to investigate the social-demographics of the communities in question. Observation was used to determine the problem or focus of the study; it also was useful in identifying the extent to which the elderly take part in diverse activities offered by the community. This observation was done in Posorja, by three 3 observers, twice a week, over a period of one month, which comes to a total of eight 8 observations. As for the survey: one was done on elderly persons (the sample of 378) to get to know the needs and recreational interests of the community (ADL) and the second was applied to evaluate three 3 specialists. The idea was to obtain a result that reflects the level of knowledge about physical and recreational projects, so as to evaluate their feasibility. (Lawton and Brody Scale and Mini Mental Test). Once the information had been collected, the data was exported to a csv file for its subsequent import and statistical treatment using SPSS V22. 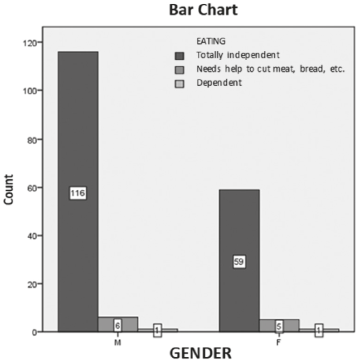 Contingency tables were applied to study the correlation between the age variables and the place where seniors go when they have a health problem12. The age range was 65-70 years and has a value of 113, indicating the elderly of Posorja (Table 4). It shows the results of the tests (Chi-squared value, degrees of freedom (df) and the significance value (Sig.)) 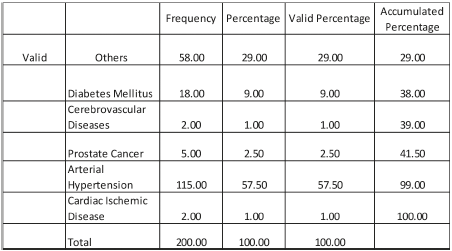 13, which demonstrate an acceptable p value, with a coefficient superior to 0.5 (p = .499) (SeeTable 5). Pearson´s Chi-squared test was used to clarify the pertinence and independence of the variables under study. It shows the results of the tests (Chi-squared value, degrees of freedom (df) and the significance value (Sig.)) 13, which demonstrate an acceptable p value, with a coefficient under 0.5 (p = .001) (SeeTable 7). 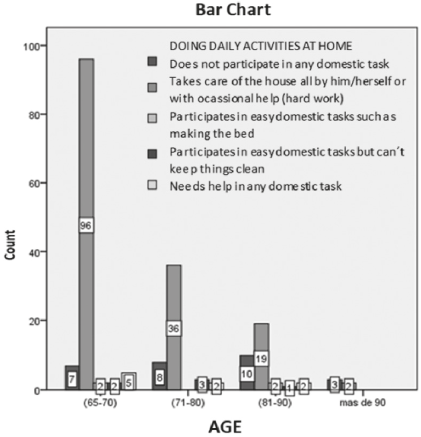 The correlation between IADL (Lawton and Brody instrumental activities of daily living) (Figure 3) and age was determined in the Posorja community to evaluate if they can be in charge of their home or need help. Seven 7 people are able to be in charge of their homes. 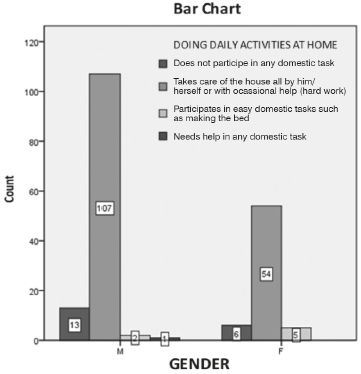 The correlation between IADL (Lawton and Brody instrumental activities of daily living) and gender (Figure 4) was determined in the Puna community to evaluate if the elderly in question can be in charge of their own homes or need help. Thirteen 13 people are able to be in charge of their homes. 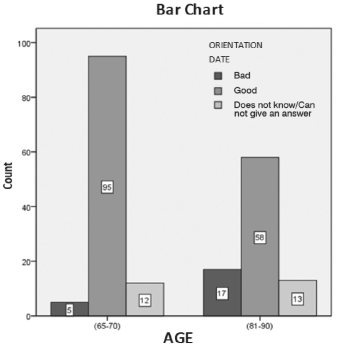 The correlation between the Mini-Mental Test results and age (Figure 5) was determined in the Posorja community to evaluate if the elderly in question can be in charge of their own homes or need help. Five 5 people gave incorrect answers and 12 people did not know or could not give an answer. Orosa (2001), quoted by Cañizares (2003), suggests the general psychological structure of an elderly person remains relatively stable and preserves its main characteristics during the evolutionary period, which constitutes a very particular phase in life. 17. The authors believe the process of ageing, from a psychological point of view, produces emotional and cognitive alterations that can affect an elderly person’s behavior. In the past, people used to picture older adults sitting in rocking chairs. But now this is changing, due to the fact that the elderly have become aware of the importance of having an active and healthy lifestyle. Ageing usually means a loss of strength and muscle mass, which translates into decreased functionality. This is why it is so important to delay that process in order to preserve a good quality of life as long as possible.30. PARA CITAR ESTE ARTÍCULO / TO REFERENCE THIS ARTICLE / PARA CITAR ESTE ARTIGO Alcívar C, Calderón J, Raffo V. Life Quality Protection Rights for Elderly People. Communities of Posorja and Puna. pers.bioét. 2018; 22(1): 90-102. DOI: 10.5294/pebi.2018.22.1.7.